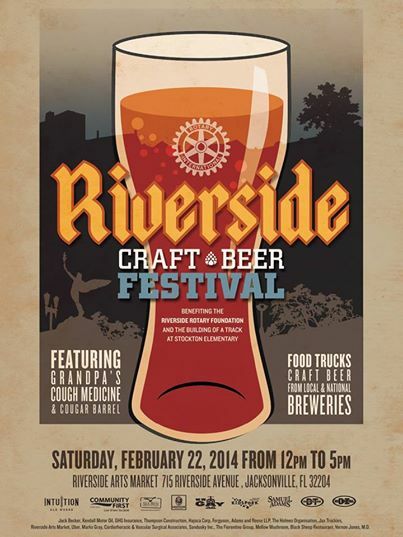 Last week I brought to you news of a new beer festival happening this Saturday, February 22 at the Riverside Arts Market. This week, the event coordinators released the beer lists for both General Admission and VIP guests. The list is heavy on local Jacksonville and Florida beers like Intuition, Cigar City, Bold City and Swamp Head Brewery. But, there are also beers from a number of regional and national craft brands like Samuel Adams, Breckenridge, Boulder, and Founders. General admission to the event is free, but those who wish to sample beers must be over 21 and have a valid, government-issued ID. Attendees then may purchase as many tickets as they like to sample the more than 60 craft beers available at the festival. Tickets cost $2 each and are good for one seven ounce pour of beer. There are also a limited number of VIP tickets available that grant access to a a tented VIP Only area, all-you-can-eat lunch catered by Mojo’s 4, special beers that are not available to other attendees, a special keepsake mug and four beer tasting tickets. VIP tickets are $100 each until midnight Friday, February 21, after that the price increases to $125. VIP tickets can be purchased at EventBright.com (https://www.eventbrite.com/e/riverside-craft-beer-fest-tickets-9880540964). The event is being put on by the Riverside Rotary Club to raise money for a walking/running track at Stockton Elementary school. The goal is to provide an opportunity for physical activity for students of the school and the neighborhood in an effort to fight obesity. Riverside Arts Market is located under the Fuller Warren Bridge on Riverside Boulevard. Parking for the event is free in the LPS surface parking lot. For more information go to the event’s website or FaceBook page linked below.